With practice, a pop up can be set up in 15 minutes. The top of a pop-up camper lifts up to reveal a living space protected from the elements. Beds pull out of the ends, providing room for campers to live and sleep comfortably off the ground. It's important to follow the steps in the right order to avoid damaging the lift mechanism. Park the trailer on an even surface. Chock the wheels and then unhitch the trailer from the tow vehicle. Attach the stabilizing wheel to the tongue of the trailer. Use the crank above the wheel to level the trailer from front to back. Step back and look at the trailer. If it's not level, use the crank to raise or lower the front. You can also use a small carpenter's level, set on top of the trailer, to check. Set the jacks. Your trailer may have 2 or 4 jacks, or none. Pull them down from the underside of the camper and make sure they're locked into position. Release the latches that hold the roof down. Insert the lift crank into its slot and slowly start cranking in a clockwise direction. If you meet resistance, stop and find out what is holding the top in place. It may be a latch that's not completely undone or the canvas might be snagged. Once you're certain the top is clear, continue cranking until the top is almost all the way up. Pull out the bunk ends and put the bunk supports in place. Stretch the ends of the canvas over the ends of the bunks. Set the door in place and check to see that it seals tightly and opens and closes easily. Raise or lower the top of the pop-up until the door is properly seated. Install the step if your model's is detachable. Set up the awning. Remove cushions and tabletops from their travel positions and set up the interior tables, benches and banquettes. Put the supports that hold up the canvas in place. Go back outside and secure the bottom of the canvas to the underside of the bunks. Connect the camper to the electrical and water services. Plug your trailer in, and hook up your white water hose and sink drain. 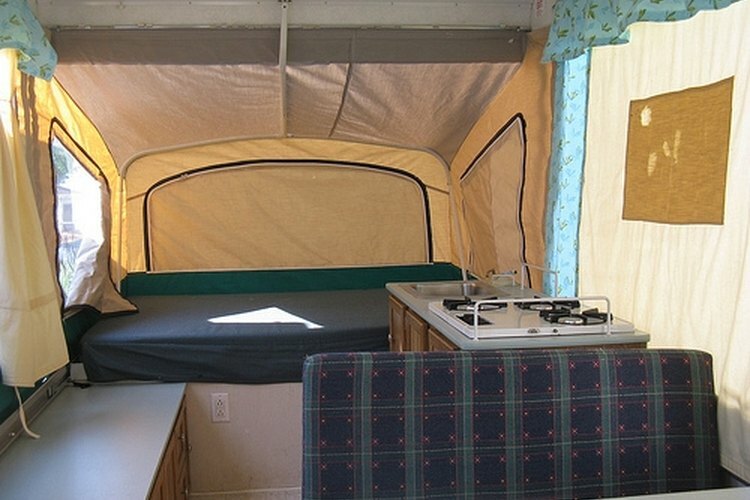 If your trailer has a bathroom, connect to the campground's sewer system. Ignite the pilot lights on the refrigerator, furnace and water heater, if your trailer has one. If you're setting up your camper in the rain, hold the canvas out over the bunk ends when you deploy them. Carry an extra crank for lifting the top of the camper in case you lose yours. Check the spare tire for air before you leave on your camping trip. Have someone stand behind the trailer and watch while you operate the turn signals, reverse lights and running lights before each trip. Don't travel if any of them are broken. Native New Yorker Meg Jernigan stayed in Washington, D.C. after attending the George Washington University, and worked in the tourism industry with the National Park Service for many years. She has extensive experience in tent and RV camping, hiking, backcountry exploration and cycling.